New wrought iron outdoor furniture is beautifully integrated into this soaring rustic outdoor space. The contemporary style of the dining table and chairs is in stark contrast to the tall stone fireplace and the rustic twig chandelier. This cozy corner offers an inviting space for dining and relaxing. 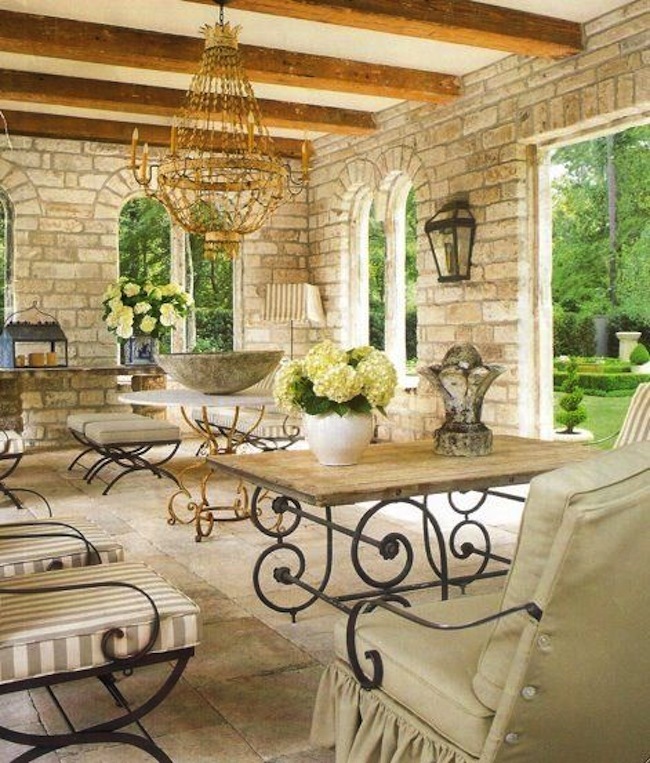 Modern wrought iron mixes well with antique wood and weathered stone. 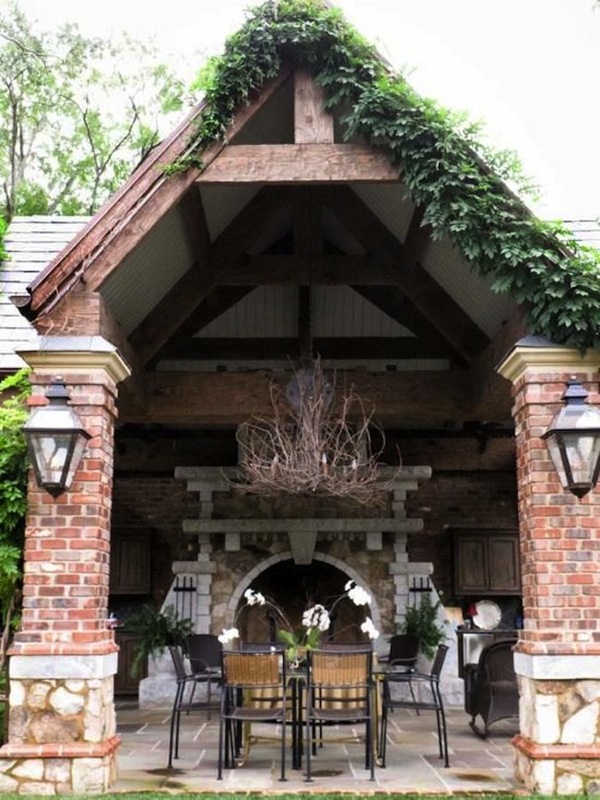 A rustic covered patio offers the perfect spot for dining in style. Comfy cushioned wrought iron armchairs meld seamlessly with a polished concrete dining table. 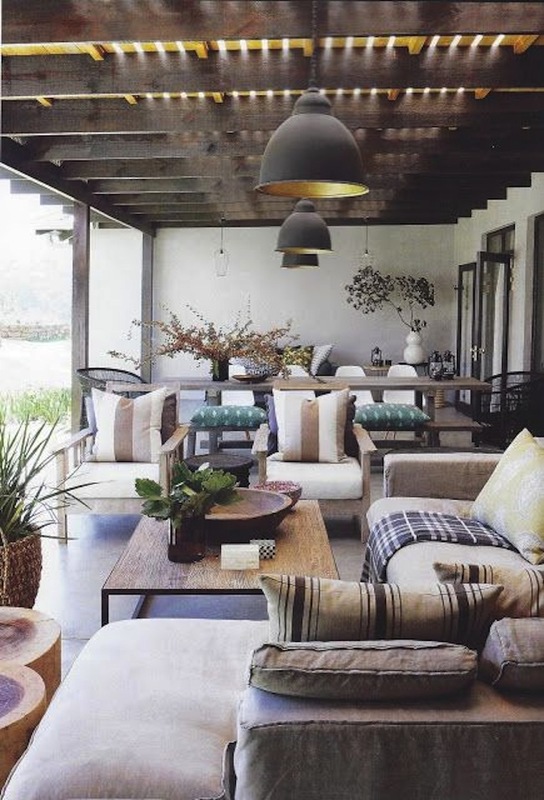 Wrought iron, wood and appealing textiles merge to create a charming look in this rustic beamed outdoor room. What a marvelous combination is the massive crowned chandelier and marble-topped iron table–both look stunning with a golden finish. 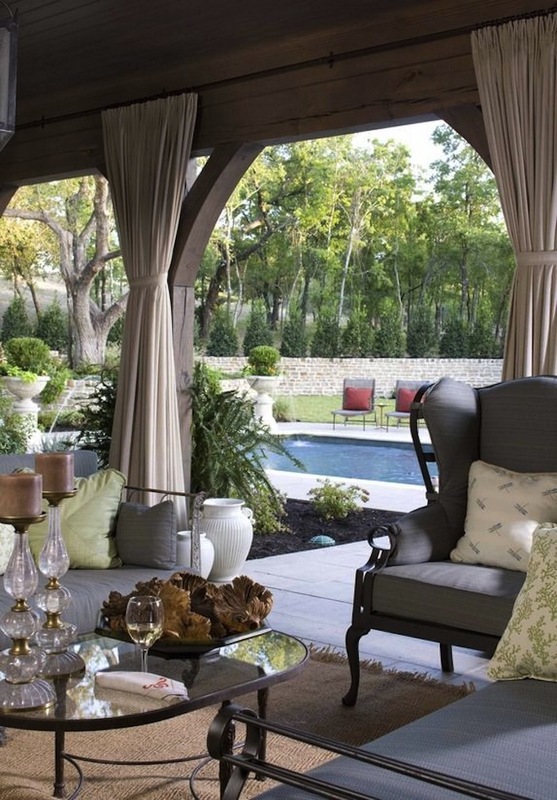 A covered patio with tied-back curtains goes totally traditional with stunning iron furnishings. We love that updated outdoor take on the venerable wingback chair. 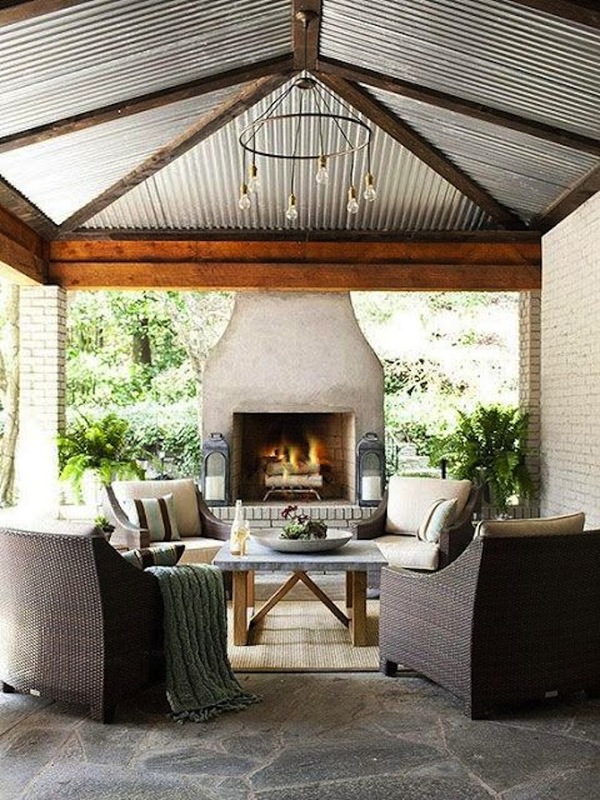 A lovely mix of old and news, iron and wood, this outdoor room is both beautiful and functional. It’s a great gathering space for family and friends. Rattan outdoor furniture, both vintage and new designs, seems so compatible with rustic spaces. 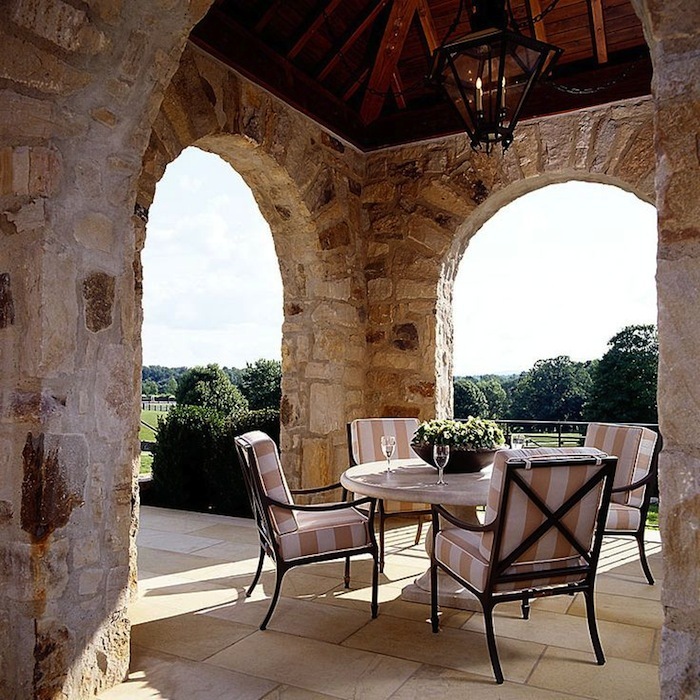 This stacked stone covered outdoor space is a great example of that compatibility. 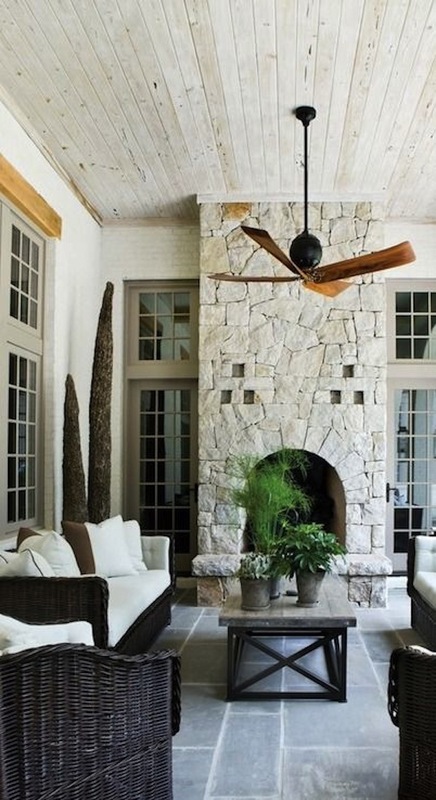 Contemporary seating with comfortable cushions creates a conversation area in this outdoor room with open fireplace. Image Sources: Pinterest.com; GreigeDesign.com; AnneDeckerArchitects.com; SouthShoreDecoratingBlog.com; Melzinha123.tumblr.com; ILoveBokkie.blogspot.fr; LarryBoerder.com; PrettyStuff.tumblr.com; DecorPad.com.